Holistic medicine treatments are on the rise in the United States and that includes the use of acupuncture. More and more Americans are looking for approaches that treat the whole person instead of just physical symptoms. According to a National Health Interview Survey (NHIS) that looked at a five-year period, acupuncture is one of the treatments that is on the rise. What is acupuncture? It's a form of holistic treatment rooted in ancient tradition that involves the insertion of needles at specific points on the body, also called acupoints. The practice helps improve the flow of Qi or Chi life force energy and treat a variety of ailments, depending on which points are targeted. 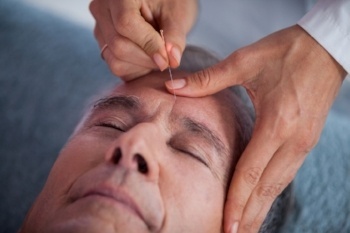 Researchers found that by the study's completion over 14 million U.S. citizens used or had tried acupuncture. That is a significant increase from the beginning of the study period, which found only 8.19 million acupuncture patients in the US. Data from this survey shows an increase in the uses of acupuncture from approximately 4 percent to 6 percent of Americans over five years, and indicates a trend for the mainstreaming of acupuncture in the U.S.
Survey investigators included health experts from the Texas Tech University Health Sciences Center in El Paso, as well as the University of Maryland School of Dentistry and University of Maryland School of Medicine in Baltimore. The patients surveyed by the NHIS say they used acupuncture as a complementary and alternative approach to conventional treatment for a specific health condition, but also used it as a preventative means to promote general health. The investigators predicted a continuation of the upward trend. The increase in the use of acupuncture as a treatment method is mostly due to the fact that more persons are realizing that it is an effective and low-risk method of treating or controlling chronic conditions. Insurance coverage for acupuncture services and increased awareness of acupuncture may contribute to the popularity and growth of acupuncture use in the U.S., the investigators noted. Acupuncture may be used either as a preventative therapy or to effectively treat a wide range of health conditions, including: digestive problems, insomnia and sleep disorders, migraines and other types of headaches, back pain, osteoarthritis, circulatory problems and sciatica, among others. It also helps with issues like mood swings, depression, anxiety and even post-traumatic stress disoreder (PTSD). Acupuncture can be used alongside conventional medicine in the treatment of both acute and chronic diseases. The Acupuncture and Massage College offers affordable acupuncture treatment through its community clinic in Miami. The College also offers training in acupuncture through our Oriental medicine program For more information (305) 595-9500.